Wisconsin draftees Steve Donovan (Madison) and Fred Borchardt (Oshkosh) met in 1965 when they were inducted into the Army together as part of the buildup for the Vietnam War. They struck up a close friendship immediately, but little did they know then that they’d go to Missouri together for Basic Training... then to Texas together for Medic Training... then to the 24th Evacuation Hospital in San Antonio... and then to Vietnam together as members of the hospital staff. During their 16 months with the 24th Evac, they managed to perform the duties of more than a dozen different military occupations including Hospital Orderly, Prisoner Guard, Construction Worker, Sign Painter, Emergency Room Assistant, Armed Sentry, Jeep Driver, Translator and Headquarters Clerk. Whatever Uncle Sam needed at the time, the authors were there to answer the call while the war raged on just a scant few miles away. Following Vietnam and college, Fred and Steve went on to successful careers in Marketing and Journalism, their chosen fields of study. And now they've written a highly entertaining book about their wartime adventures! In it they've chosen to focus not on the horrors of combat but on the most interesting and amusing aspects of their experiences in Southeast Asia. In so doing they've told a highly revealing yet surprisingly humorous story that's not likely to ever have been heard before. Often hilarious while occasionally alarming or heart-rending, overall it's a truly funny and refreshing look at the Vietnam War. 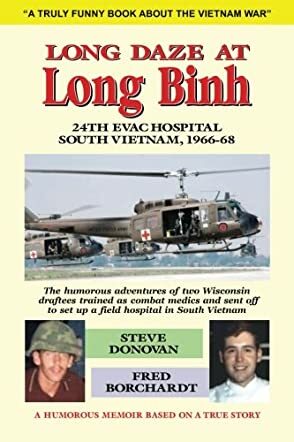 Long Daze at Long Binh, subtitled the humorous adventures of two Wisconsin draftees trained as combat medics and sent off to set up a field hospital in South Vietnam by Stephen H. Donovan and Frederick Borchardt, is a unique take on the infamous Vietnam war. Two young Americans find themselves together in Fort Leonard Wood as they are inducted into the US Army as draftees in 1965. Thus began their stint with the 24th Evac Hospital Hospital, working in various military occupations from hospital orderly to bartender to sign painter, among others. Together with 2.4 million American non-combatants, they were thrust into the bloody Vietnam war but, fortunately, their story is not what many readers would most likely expect. Stephen H. Donovan and Frederick Borchardt's Long Daze at Long Binh is a Vietnam war memoir like no other. The book's format is designed in such a way that the two friends reminisce about their war experiences and readers are allowed to eavesdrop on them. And it will be a unique, witty, entertaining and hilarious roller coaster ride. Long Daze at Long Binh is indeed a refreshing read about a subject that automatically reminds many of us of death and destruction. And this is what makes this memoir deserving of a space in our crowded bookshelves or in our memory drives. Together, authors Stephen H. Donovan and Frederick Borchardt take us through an informative and fateful journey that hundreds of reluctant young American men took in a war that normally evokes misery and sufferings, but this time, however, humor will win the day. Long Daze at Long Binh is a true to life work of comedy non-fiction detailing the unusual experiences of authors Stephen H. Donovan and Frederick Borchardt. It is self described as ‘The humorous adventures of two Wisconsin draftees trained as combat medics and sent off to set up a field hospital in South Vietnam’, which is basically exactly how the premise of the tale begins. This is a somewhat surreal account of life in that context, stuck in the middle of a war zone but without actually seeing any front line action or very much of anything frightening that we usually associate with war. Instead, these medics in training find themselves performing many different jobs for the war effort as part of their sixteen months as draftees. Having recently read a similar account of a journalist in a non-combatant position in Vietnam, I was pleasantly surprised by this light, upbeat and very amusing tale born right out of that same conflict and context. Stephen H. Donovan and Frederick Borchardt really get their personalities across during the narration of their circumstances and the things they got up to out in Vietnam. They were front-row veterans of the ‘entertain the troops’ effort, so have many celebrity tidbits to impart, and the adaptability of the two young men to life in such bizarre conditions was really admirable. In general, it was fascinating to read about civilian doctors and nurses thrown into a combat zone, and I’m sure readers with similar memories and experiences will agree that Long Daze at Long Binh is a wonderful reminiscence.